You can remove an extent from the scale-out backup repository, for example, if you do not want to store backup files on the underlying storage anymore. When you remove an extent, Veeam Backup & Replication puts the underlying backup repository to the Maintenance mode and unassigns the extent role from it. The backup repository ceases to exist as a part of the scale-out backup repository and becomes a backup repository. Put the extent to the Maintenance mode. Evacuate backups from the extent. In this case, backup files will be moved to other extents of the scale-out backup repository, and the backup chain will remain consistent. If you do not evacuate backups from the extent, the backup chain may get broken as some restore points will be missing from it. In the working area, select the scale-out backup repository and click Edit Scale-out Repository on the ribbon or right-click the scale-out backup repository and select Properties. In the Extents list, select the extent and click Remove. 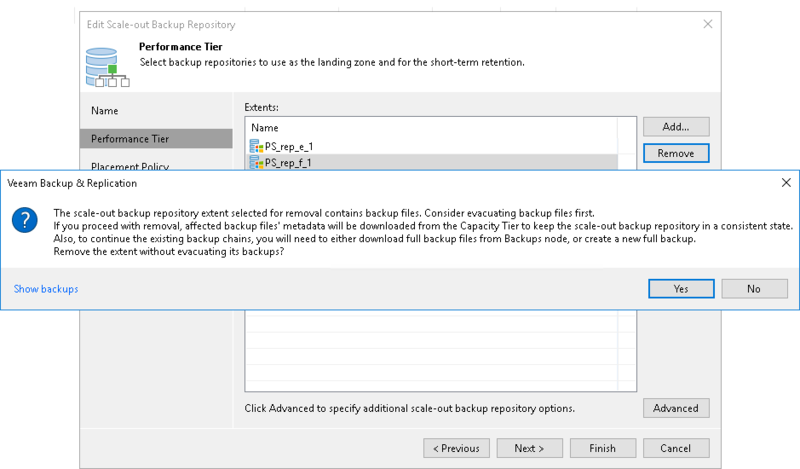 If the extent contains backup files, Veeam Backup & Replication will offer you to evacuate them. To evacuate files, click No, close the wizard and evacuate backup files. For more information, see Evacuating Backups from Extents. If you do not want to evacuate backup files, click Yes and proceed with the wizard.